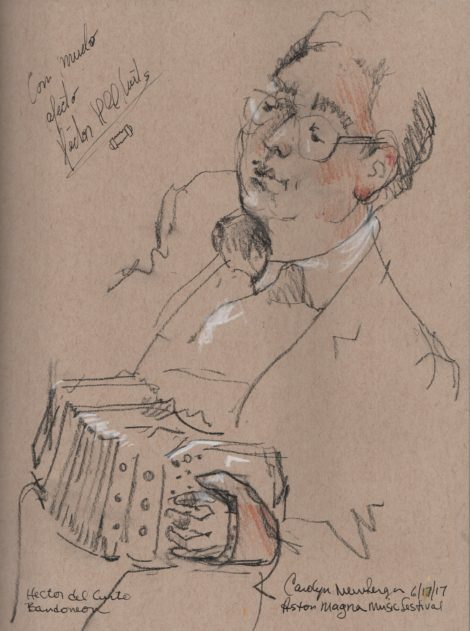 Hector Del Curto, bandoneon, during Aston Magna Music Festival's opening concert at St. James Place in Great Barrington, Massachusetts. Great Barrington — Music for Forbidden Dances began the Aston Magna’s 45th season with verve, courage, and foresight. The concert took place on June 17 in the beautifully refurbished St. James Place in Great Barrington. This inspired survey demonstrated how notable composers built enduring creative frameworks on the sly rhythms and affecting melodies in early Sarabands, chaconnes, and tangos. Daniel Stepner, leader, baroque violin and violin; Hector Del Curto, bandoneon; Santiago Del Curto, clarinet; Judith Gordon, piano; Diane Hefner, chalumeau and clarinet; Frank Kelley, tenor and speaker; Christopher Krueger, recorder, baroque flute, flute, and typewriter; Catherine Liddell, baroque guitar, theorbo; Jisoo Ok, baroque cello, cello; Jonathan Hess, percussion. A whimsically named medley, Ensalada de Saravandas y Chaconas from the early 17th century (sarabands and chaconnes by Tarunio Merulia, Juan Aranes, Antonio Bertali, and Claudio Monteverdi), got one’s blood flowing and foot tapping. It proceeded through two 18th-century Sarabands by Arcangelo Corelli and a Chaconne by Jacques Morel, to Johann Sebastian Bach’s exquisite Sarabande from the Partita for Flute, with its gorgeous 12/8 meter built on a repeated, flowing harmonic sequence. Christopher Krueger’s sublime dynamic nuances, subtly emphasizing its inner contrapuntal voices, informed this interpretation. Then came Stepner’s urgently gripping account of the Ciaccona from Bach’s Second Partita for violin. That such spectacular cascades of double- and triple- stops, three- and four- part counterpoint, and an overwhelmingly affecting, shifting palette of colors, could emerge from the gentle tessitura of his baroque violin — filling this resonant hall with splendid echoes sand heartfelt emotions — spoke volumes to the composer’s insights and to this performer’s passionate probing. The warhorse leapt, becoming a panting unicorn: imaginative, magical and colorful. Listen, please, to Stepner’s splendid 2015 Naxos recording of this Ciaccona. Although it is but a sample of this performance, you can, if you listen carefully, discern the multiple voices, including repeated notes (pedal points) over and beneath which Bach configured rich harmonic progressions from intersecting contrapuntal lines, and touching resolutions of the dissonances attending to their logical collisions. More fireworks followed in the second portion of the concert, drawing the time frame quickly to the recent past and present. A duet arrangement of a familiar song in 3/4 time, El Dia que me quiras, (“The day that she loved me”) by the acclaimed 20th century Argentine Tango composer Carlos Gardel introduced Del Curto’s bandoneon. This accordion-like instrument’s supple, reedy sonorities contrasted deliciously to the warm legatos of Jisoo Ok’s cello. One was tempted to sway. Then, Canto para ti, by Luis Del Curto, brought forth the expressive bandoneon (whose quiet tremolos substituted convincingly for the impossible vibratos), and Hector Del Curto’s and Jisoo Ok’s 11-year-old son Santiago del Curto, a virtuoso clarinetist of astonishing musical maturity. The composer, Luis Del Curto, was Santiago’s grandfather, and the boy made his music breathe through a rainbow of colors. Santiago’s judicious accents, perfect intonation, transparent phrasing, and acrobatic leaps to the very high register were marvelous to behold. His technical wizardry was expressed in dynamic synchrony with his parents’ driven emotions. The performance evoked the deep heritage of the song and the family. It dripped with swinging rhythms and romance. One was seduced. The concert was brought to a thrilling close by an extraordinary comic opera by the contemporary composer, Robert Xavier Rodriguez, whose Tango brought together a much larger ensemble, including bandoneon, 2 cellos, percussion, violin, guitar, and the remarkable Frank Kelley, tenor, speaker, Sprechstimme-ist, and dancer. Here, Christopher Krueger doubled on typewriter. Indeed, typewriter! This was no Leroy Anderson confection. But if you care to, you will surely enjoy this definitive version of Anderson’s The Typewriter in the link above. The instrument conjured the atmosphere of a busy reporter, excitedly composing copy at his desk on stage right, describing the rapid, worldwide dissemination of the lubricious, new dance. “London, October 7, 1913! The tango is the new dancing craze. Tango clubs are being formed. “Berlin, October 18! One of the major department stores has introduced Tango Teas, which are attracting throngs of people. Music: fortissimo piano, typewriter, and percussion. “Paris, November 1! Monsieur Martin announces that Tango will be permitted at the Paris Balls, but strict limits will be imposed on the program. “Cairo, December 5! None but the most refined forms will be countenanced during the social season. “Rome! The Vatican issues an instruction to the clergy, warning of the spread of the Tango infection. “Florence! There are both Tango Teas and a Tango Festival! Music: growling Tango rhythms, ineluctably mounting and scalloping phrases, then chimes, punctuating the pronouncement of sanctions, with forte typewriter. “A Cardinal’s letter is sent to all the bishops of Italy, forbidding the dancing of the Tango. Severe penances will be imposed on those defying the order. Music: Rapid drum roll on the tom-tom. Staging: At this point, Frank Kelley, the erstwhile reporter, dashes across the stage to a high rostrum and, having changed into a black cassock and black biretta of a cardinal, proclaims his sermon. Prayerfully, the cardinal delivers a lecture on immorality, “even of Protestant countries.” To a Tango rhythm, Kelley continues in Sprechstimme (speech song). Music: Louder and louder rhythm and harmonies richly resonant of Kurt Weill. The cardinal instructs the clergy. Staging: Frank Kelley returns to the news desk at stage right. “Boston, 1914! The first death reported due to Tango dancing. “Paris, 1915! The French Academy calls on the International Conference of Dance Teachers to consider changes in its pedagogy. But the words “Thé Dansant” must be substituted for the word Tango. Staging: The reporter is pulled by the dance to center stage, and dances exaggeratedly before returning to his desk. Music: Typewriter. Then cello solo, and accelerando with piano in a waltz, which transmogrifies into a strong Tango rhythm. Tango (1985) is a one-act comic concert opera for tenor solo and chamber ensemble. The text was compiled by the composer from actual news clippings, letters and sermons from the height of the tango craze (1913-14). There are three short scenes played without pause. In scene one, the tenor enters as an elegant tango dancer, then quickly changes character and becomes a radio newscaster, reporting world-wide reactions to the tango, both favorable (tango teas, parties, baths and massages) and unfavorable (declared a crime in Boston and a sin in Rome). In scene two, the tenor again changes character and becomes Cardinal Basilio Pompili, Vicar of Rome, as he declaims a thunderous sermon denouncing the tango in the name of Pope Pius X, but getting caught up in the tango spirit in spite of himself. In the final scene, the tenor resumes his newscaster character to report attempts to reform the tango into a more respectable dance called “The Paragon,” with numerous rules for avoiding physical contact between the partners. He impersonates a dance instructor and demonstrates the paragon, but is gradually drawn back to the tango as he exits in his original character as a tango dancer. The score of Tango evokes the sounds of a typical cabaret ensemble of violin, piano and accordion with prominent solo passages for those instruments. Further tango atmosphere is achieved by the use of several quotations of familiar classics (Beethoven’s first Piano Concerto, Bach’s “My Heart Ever Faithful,” Schubert’s E-flat Major Piano Trio and Brahms’ Fourth Symphony) arranged in tango style. Also quoted are the medieval Mass of Tournai, which is used to represent the Vatican, and Minuet” from Mozart’s Don Giovanni, which is, in its original setting, used to accompany Don Giovanni’s romantic exploits in the ballroom scene, but is here employed to represent the “properly danced” paragon. As in Mozart’s opera, the minuet is accompanied by three contrasting dances: in this case three tangos, in different instrumental colors and in different meters, which gradually envelop the minuet. This was a fitting finale to a provocative, insightful concert. In so many ways, Daniel Stepner and his band made early music new again.